In his debut Goldberg Variations (Claves, 5/05), Cédric Pescia’s pianistically oriented Bach-playing was vital and direct. It’s now self-aware and pretentious. One telltale sign in Die Kunst der Fuge concerns Pescia’s habit of beginning or ending specific lines after the beat behind the other voices. He plays Contrapunctus 1’s opening subject slowly but picks up the tempo a little bit as the other voices enter. No 2’s dotted rhythms are too rigidly articulated to march forwards effectively. Pescia italicises No 3’s slithery chromaticisms with sighing tenutos and oily legatos. By contrast, the brisk and crisply shaped No 4 begins softly and builds to a gradual, uplifting climax. A fast, driving and arguably glib Canon at the Octave follows. No 5 is slow and spongy, in contrast to Charles Rosen’s austere inner strength. Pescia’s double-dotting in the No 6 ‘French overture’ causes the music to bog down and stagnate. But No 7’s expanding and contracting rhythms benefit from Pescia’s gentle fluidity, and his unusual slowing down of the final measures makes plausible musical sense. The Canon at the Tenth is slow, listless and buttery, capped by an uneventful descending minor scale that serves as the cadenza. Nos 8 and 9 lack suppleness, while, by contrast, No 11’s dense textures and extraordinary harmonic invention sound newly minted via Pescia’s understated animation. The four-voice mirror fugues transpire at a reverential crawl but the three-voice mirror fugues skip their merry way. However, Pescia saves his crawl from hell for the usually amazing Canon in Augmentation and Contrary Motion: 10 minutes of unmitigated boredom. 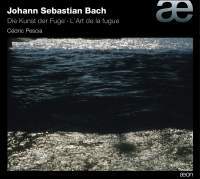 For The Art of Fugue on piano, Rosen (Sony) and Koroliov (Tacet) remain top-choice references.